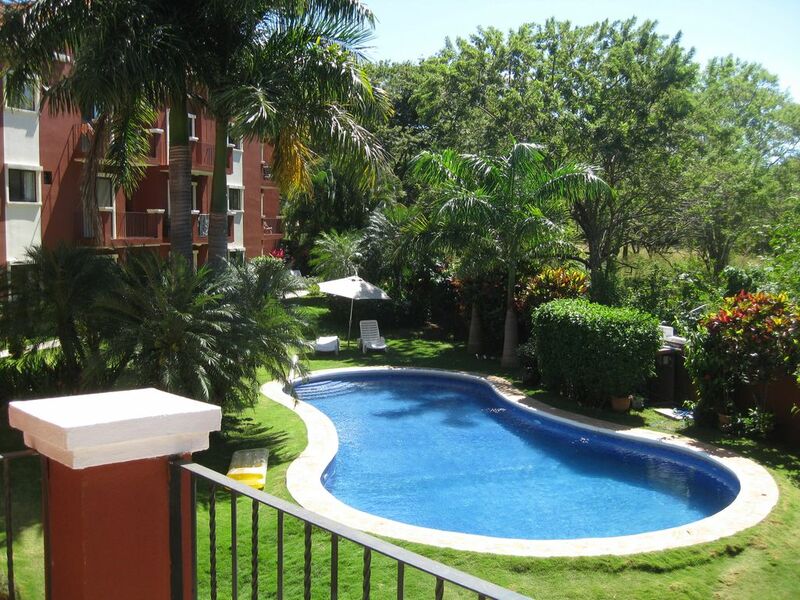 This luxuriously furnished condominium is conveniently located in the heart of Tamarindo village, close to all the amenities of the area - restaurants, grocery stores, pharmacies, banks, shops and nightlife are just steps from the property. The condo unit features 2 bedrooms, 1 with a queen sized bed and the other with two twin beds. Four adults or small families will be very comfortable. The residence has 2 full bathrooms, including granite countertops and walk-in showers in both. Additionally, the full kitchen features all the appliances and comforts of home. Guests will enjoy the very private and quiet surroundings, tranquil pool and the lush landscaping of the gardens. The common areas of the property are fully secured and offer management on premises 24 hours/day. Also, a free parking area is available for those renting cars, although a car is not necessary for everything is walkable in Tamarindo. The ocean is just steps from the condo (600 feet / 200 meters) to enjoy surfing, water sports or watching the beautiful sunsets of this amazing beach area. This rustic surf town also offers the conveniences of local shopping, great restaurants and casual hangouts. Both bathrooms feature walk-in showers, perfect for cleaning out after a day at the beach or playing in the jungle. Each bathroom is spacious enough to provide area for dressing and changing. Additionally, vanity areas with plenty of space to get ready for an evening on the town. North American (US 120 V) appliances can be used in the outlets. A hairdryer is provided in the master bathroom. Drying rack in unit. Clothes dryer is provided in condo communal building. A queen sized aerobed is also included, should guests have young children. we really enjoyed our stay at Ryan's condo and were very impressed at the amount of kitchen equipment, bedding and towels available. The beds were firm and we found them very comfy. The aircon also was responsive and easy to alter. We had a problem operating the safe and The management company were very quick to help us. Ryan also had a folder with useful local info including restuaurant reviews. We particularly loved Patagonia at the end of the street which had amazing food and great atmosphere. The Balcones complex itself is a little run down and could do with an overhaul and better/more frequent pool cleaning but this didn't put us off, the location was fantastic - very central but set back from the action enough to be quiet. We were not disturbed by other residents during our stay despite having neighbours on all sides. We would not hesitate to go back to Ryan's condo and felt it was great value for money. Tamarindo is located in the Guanacaste region of Costa Rica along the Pacific Ocean. A 45 minute drive from the Liberia Guanacaste Airport or 5 minutes from the Tamarindo Airport (a short 35 minute flight from San Jose). Tamarindo is approximately a 5 hour drive from San Jose. Visitors of Tamarindo enjoy the beautiful coast line, casual surf-town atmosphere and the surrounding eco-tourism. While not over developed by any means, Tamarindo provides guests with excellent restaurants, nightlife and activities for the whole family. Common activities in the area are relaxing on the beach, surfing (great area for beginners), zip-line tours, jungle hikes, mountain biking, sailing cruises, eco-exploration, kayaking, deep-sea fishing. The condo is located just off the main street, close to everything, but yet secluded enough to have privacy and quiet. A grocery store is only steps away, the property manager's office is at the end of the block and the beach is also just a block away. The local property manager will provide a formal rental contract.